SAN JUAN, P.R.—Who doesn’t like a Cuba Libre? If you are not familiar with the tropical drink, it is an icy cocktail with sugar cane flavored rum mixed with a classic soft drink, Coca Cola. Sipped around the world at nightclubs and bars, the cocktail is part of a rich history based in a tropical oasis called Puerto Rico. The famous Bacardi Rum Co., was first established by its founder, Don Facundo Bacardi Masso in Santiago de Cuba, Cuba. Bacardi rum won its reputation in Cuba and soon became the preferred rum to drink of kings and queens throughout Europe. The Spanish colonial style of the visitor center at Bacardi reflects the company’s roots (Photos by Alcione Gonzalez). Despite being established in Cuba, the company later moved to Puerto Rico after Castro’s dictatorship rose to power in 1958. With the move to a new country, the Bacardi Rum Distillery was built in Catano, Puerto Rico. From the heart of tourism in Puerto Rico, Catano is a 20-minute taxi ride from Old San Juan. We decided to visit Casa Bacardi because it was a fun activity that could be completed on a lazy afternoon. 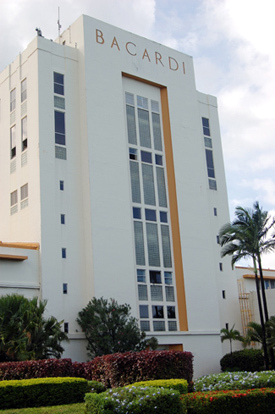 The Bacardi factory, which receives up to 250,000 visitors a year, was a fun and entertaining departure from typical Old San Juan, where classic architecture, and fort history of San Cristobal and El Morro are the main attractions. Our trip to the Bacardi Distillery and Museum started by hopping on an Aqua Express bus that can be found at the Catano Ferry dock. The purchase price for the fare was an exceptionally cheap and affordable .50 cents per person. After a 15-minute bus ride, comprised of mostly tourists, we were dropped off in a residential quiet section of the city of Catano. There we were directed by friendly, and slightly aggressive taxi drivers who lead tourists to a row of vans eager to be filled. All vans were bound to the Bacardi distillery. Later, we were told that a local bus route could also take us to the distillery. Advice given by locals and hotel staff emphasized that the average taxi fare per person to the Bacardi distillery would be no more than $3 per person and to stand our ground if anyone tried to ask for more. 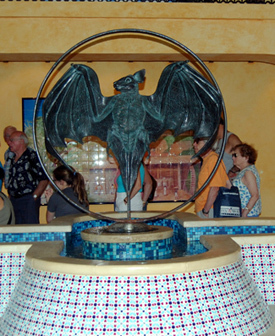 Upon arrival to the Bacardi Distillery, the Bacardi logo, a fruit bat, was seen almost at every corner. The fruit bat symbolizes good health, fortune and family unity for the Bacardi brand. At the entrance, a large cream white Spanish-style building with the “Casa Bacardi” (Bacardi House) sign and two bulls at the entrance were the first structures seen, and towards the left of the building was a large canopy with a long expansive bar under adorned with Bacardi cocktails through out it’s various shelves. A friendly bartender with a guayabera (a classic Cuban button-down shirt) exuded a pleasant air and welcomed visitors with a bright smile. Entrance to the Bacardi Distillery and Museum was free and so were the complimentary cocktails. Each visitor at least 18 years old was given two complimentary Bacardi cocktails tickets that could later be redeemed at the bar. Tours were offered in English and Spanish, and began every 15 minutes through out the day. We chose the English-language tour and were given pink tickets stubs to redeem for our drinks. Jumping on a tram for a 30-second ride, we were then dropped off at the entrance of the Bacardi museum with our tour guide, Juancho, leading the way. Juancho gave a humorous and light explanation of the historical foundation for the Bacardi brand. 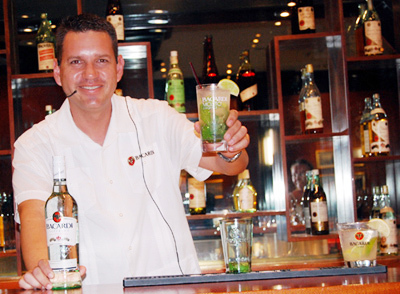 At right, a Bacardi bartender offers a cool sample to visitors. Below, a colorful entrance way in the visitor center and one of the Bacardi buildings in the factory campus. The entrance to the museum was a recreated Spanish courtyard. The history of the Bacardi brand is associated with three themes of the Caribbean: Christopher Columbus, sugar cane cultivation and piracy. The themes are illustrated with tile portraits on three of the walls in the Spanish courtyard. We were later ushered into a movie theater, and shown a 15-minute video of the Bacardi’s history, where it pretty much was a commercial for the Bacardi rum brand. The video was definitely the low point of the tour. But visitors can take advantage that you can sit down and relax while watching the video. After cooling down in air-conditioning for 15 minutes, we were taken into an interactive area that had a recreation of a Bacardi rum distillery. Photography was not allowed and we were quickly scolded as we eagerly tried to capture the authentic looking barrels and distillery machines. We were later ushered into a movie theatre, and shown a 15-minute video of the Bacardi’s history, where it pretty much was a commercial for the Bacardi rum brand. The interactive area explained the process for creating and aging the rum. 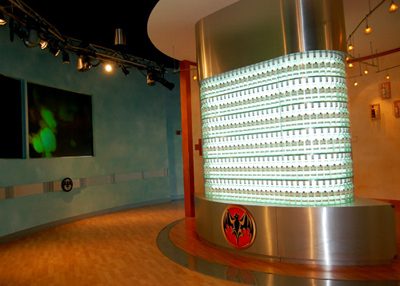 Visitors could listen to the history by standing inside a glass booth where speakers narrated details of the history of Bacardi. Smelling booths were also divided into light-bodied rums, premium aged rums, and flavored rums. Visitors were given the opportunity to differentiate the difference in smell for each blend of rum. The most exciting part of the tour was the bar instructional section.We were greeted by our bartender for the session, Juan Cartajena, who proclaimed that we would learn how to make delectable Bacardi cocktail in four minutes. Even though the bartending instructional was a blatant advertising plug for Bacardi, he insisted that if you are going to drink rum, drink Bacardi, emphasizing that it is, in his opinion, of course, the best rum in the world. We ended our tour at the bar where we tried the famous Mojito and Cuba Libre cocktails. Despite the tour being all things Bacardi and a shameless plug for the brand, the tour is a fun, laid-back experience, and takes no longer than a quick afternoon visit. Visiting the Bacardi Distillery and Museum is a fun alternative to the more traditional fun of Old San Juan. Besides, after all that fort sight-seeing, you’ll definitely be thirsty for an authentic Bacardi Cuba Libre. Driving? From San Juan take Highway 22 west to the Cantaño exit, Road 165. The plant is visible on the right about a mile from the exit on Road 165, km 2.6, Int. 888, at the Bay View Industrial Park in Cantaño. Art is on display for guests to enjoy in the visitor center.